"High Times For Low Crimes"
"You Can‘t Spell Diesel Without Die"
The result is a malicious, fierce album that merges its various musical influences from dirty Heavy Rock, Doom, Stoner and old school Death Metal into an original diabolical brew. Get ready for the hottest mixture that the European scene has to offer at the moment and not without reason bears the clear title “Lücifer”. On the joint European tour with BULLET and SCREAMER last year, the JESUS CHRÜSLER SUPERCAR fans could already convince themselves of the quality of the title track as well as the mangy uptempo rocker “Flesh ’n’ Bones” and the skills of the new guitarist Tobbe Engdahl! 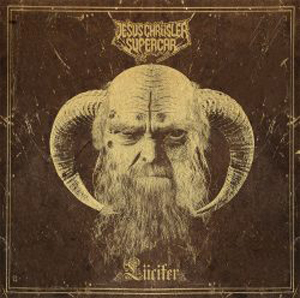 JESUS CHRÜSLER SUPERCAR have already caused a worldwide sensation with their brilliant video clips for the singles “Killing Machine“, “Pitchfork”, “God Gave Me Nothing”, “From Hell” and “Let It Roll”. This tradition will be followed by Pär Brännström’s new music video for the first single release “Lucifer”, which will be available on April 26th, 2019.